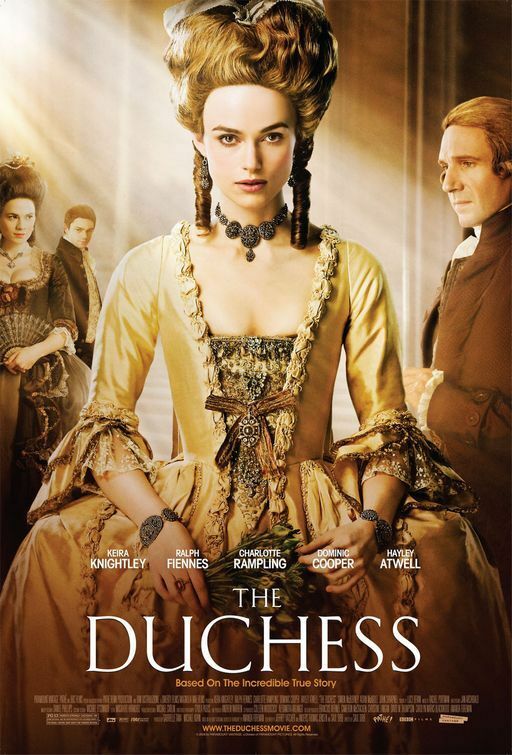 Splendid palaces, elaborate wigs, stunning costumes - "The Duchess" sure is a handsome period drama. Frankly, I didn't know much about the fascinating Georgiana, Duchess of Devonshire (1757-1806) before watching the 2007 movie with Keira Knightley and Ralph Fiennes in the leading roles. Born a Spencer and thus the great-great-great-great-aunt of Diana, Princess of Wales, she was married off at the tender age of 16 to William Cavendish, 5th Duke of Devonshire, a man who loved his dogs more than his wife. However, Georgiana quickly becomes the darling of society admired for her beauty, charisma and leading fashion and style. As Lady Elizabeth 'Bess' Foster, Georgiana's confident and future mistress of William puts it; "Well, as they say, the Duke of Devonshire must be the only man in England not in love with his wife." The only thing the Duke is interested in his his wife's ability to bear him a son. However, Georgiana sees more in herself: She is an outspoken liberal, supports the American and French revolutions, and is a prominent campaigner for the Whig party and several of its members including Prime Minister Charles Fox, a feminist who dares to speak publicly on politics, although she apparently accepts that women do not have the vote. It is the few rights women have that also put Georgiana's love affair with another famous Whig and future prime minster, Charles Grey, whom she bears a daughter, in jeopardy. In the end, she must chose between her love and her children... A fascinating tale of a woman remarkably similar to that of another Spencer woman of more recent times.